Complete our online form and get a comprehensive house cleaning quote in 5 minutes. No card required, no commitment, no hassle. Providing the best housekeeping throughout the greater Seattle area. We only use green products in your home, which are biodegradable and safe for children and pets. Our responsive staff returns phone calls, emails, quote requests and Facebook messages in a timely manner. With a recurring cleaner, we remember your personal cleaning preferences, providing the best result each time. If you're unsatisfied with your cleaning, we'll come back and clean the missed areas at no additional charge. What cleaning services can we offer you? Read about each cleaning service below to find the best fit for you. We provide regularly scheduled maintenance cleanings to keep your home beautiful throughout the year. Learn more about our recurring plans.. Need a heavy cleaning? No problem. Our team specializes in thorough, deep scrub and Spring cleanings. 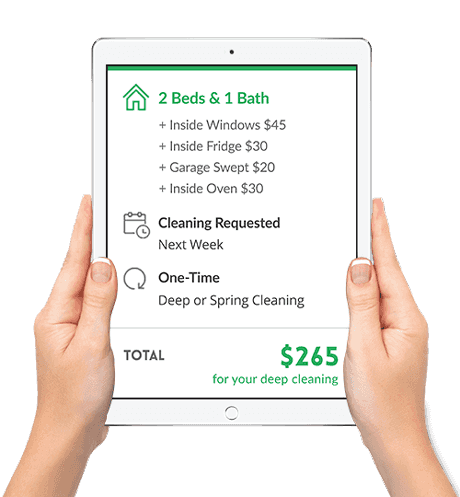 Read about our most popular package..
A house cleaning in the midst of a move requires a different approach. We're very experienced in these unique situations. See how we'll help your move.. Whether preparing to have guests over or dealing with the mess after guests leave, we've got you covered. Check our party cleanup plan..
From a dentist's office to chiropractor's, the importance of a sanitary health office building cannot be overstated. View our medical clinic services..
Our commercial cleaning services have helped dozens of offices and businesses function in a clean, professional setting. Check out our office cleaning plans..
Cities as: Seattle, Bellevue, Redmond, Tukwila, Burien, Algona, Kirkland, Clyde Hill, Sammamish, Shoreline, Federal Way, Woodinville, Yarrow Point, Milton, Kenmore, SeaTac, Newcastle, Kent, Beaux Arts Village, Renton, Pacific, Covington, Bothell, Hunts Point, Normandy Park, Lake Forest Park, Auburn, Edmonds, Des Moines, Mercer Island, Medina, and more. Simply Clean has been a premier Seattle cleaning company since 2009, servicing all of King County for over 8 years. And while we’ve only been in Seattle since ’09, our experience in house cleaning extends much farther back. Our managers have many years of experience in the cleaning industry and each of our Seattle house cleaners have many years of professional cleaning time under their belts. If you’re looking for your home or office to be professionally cleaned, our Seattle maids and house cleaners are the answer you’ve been looking for. Not only do we specialize in residential cleaning, but we also provide excellent office cleaning as well. Whether you’re a property owner looking for a thorough cleaning before a showing or a busy family who needs a helping hand, we’ll be there for you. We are professional, trustworthy, and punctual. Give Simply Clean a try! After all, you deserve a hand around the house. Our commercial cleaning services are perfect for both small and large businesses throughout many different industries. Our trained office cleaning staff are highly experienced with many different office setups and will maintain the professional look of your company. A clean carpet is one of the most noticeable aspects of a clean home. We're happy to provide expert upholstery and carpet cleaning to give you the best possible cleaning experience.